Mount Eisenhower (also known as mount Ike) is a 4,780 foot mountain in the Presidential Range of the White Mountains. Formally called Mount Pleasant, this mountain offers 360 degree stunning views. The summit is marked by a large cairn, in the center of a flat circle area surrounded by rocks and boulders (perfect for a seat for lunch). The mountain was named after President Dwight D. Eisenhower. 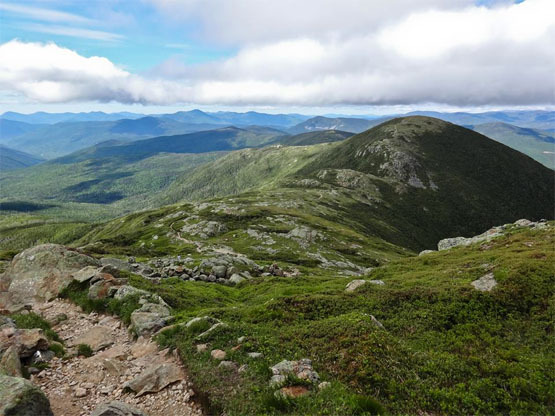 Many people choose to hike Mount Pierce and Mount Eisenhower on the same hike by making a loop, this is known as Peak-Bagging (also mountain bagging, hill bagging, summit to summit). It is a great way to cross multiple mountains off your list in one day, and not to mention have multiple views! The shortest trail up to the summit of Eisenhower is the Edmand's Path located off Mount Clinton Road in Carroll, NH. It is a 3.3 mile hike up to the summit. Mount Pierce (Formerly named Mount Pleasant) is a 4,780 foot mountain in the Presidential Range in Carroll, New Hampshire, Coös County in the White Mountains. 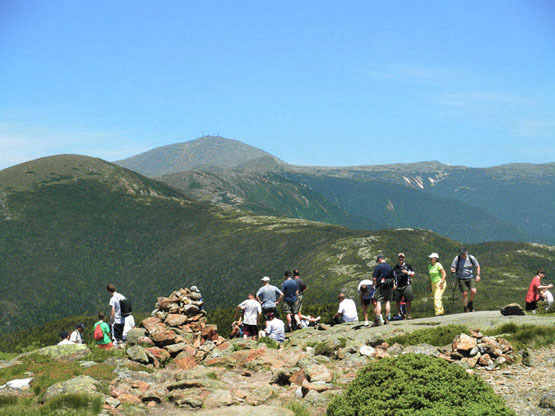 It's summit offers 360 degree views of the New Hampshire mountains including Mount Washington. It was named after President Dwight D. Eisenhower. The two most common routes to Mount Eisenhower's summit are the Crawford Path and Edmand's Path, both beginning on Mount Clinton Road (in different parking lots). Mount Eisenhower. Photo taken by hiker Abhijeet Kumar. Taken June 2014. 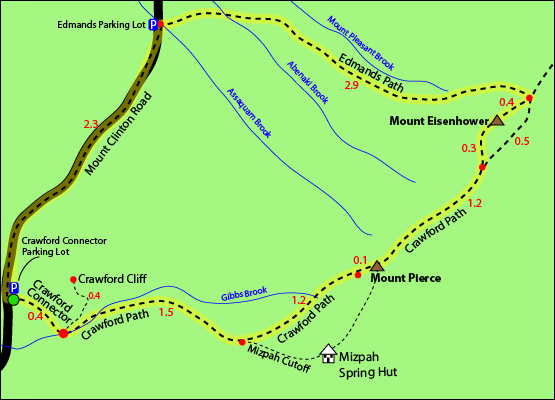 The map below shows how to get to the summit of Mount Eisenhower, as well as Mount Pierce. This is a loop hike (see map below) and there are 2 parking lots you can park at: the Edmand's parking lot or the Crawford Connector parking lot. (both on Mount Clinton Road) The directions below are based on parking in the Crawford Connector parking lot, hiking up to Mount Pierce then over to Mount Eisenhower, and back to the same parking lot. Begin on the Crawford Connector Trail for 0.4 miles.You will come to a foot bridge over Gibbs Brook, where there are beautiful cascades to look at. Just after you cross the bridge, follow the signs veering left/straight to begin the Crawford Path Trail up to the summit of Mount Pierce (going right will bring you to Route 302). Looking to Mount Eisenhower from the Crawford Path on June 19, 2010. Cairn at the top of Mount Eisenhower on June 19, 2010, overlooking Mount Washington. 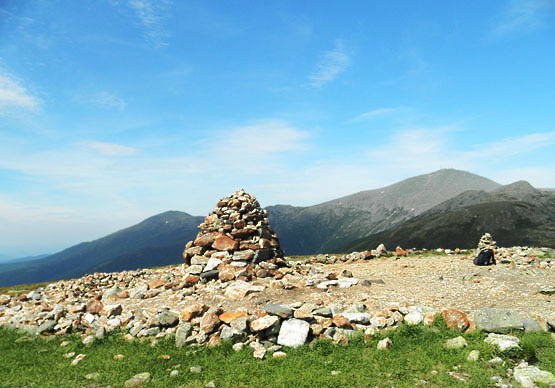 Cairn at the top of Mount Pierce on June 19, 2010, overlooking Mount Washington. 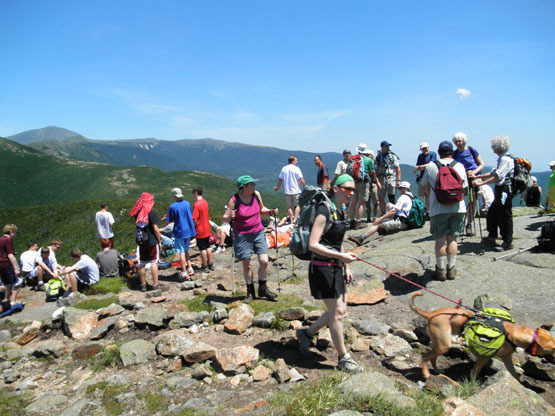 Lot of hikers on Mount Pierce on June 19, 2010, overlooking Mount Washington. 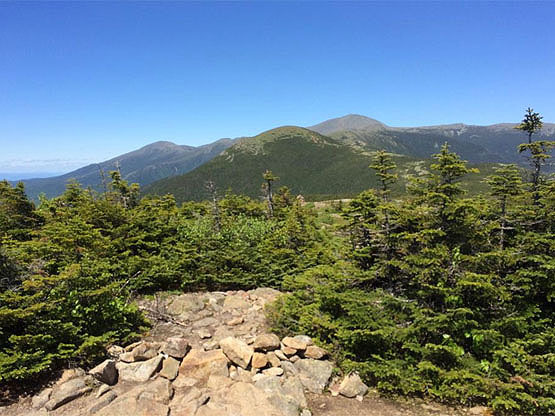 Photo taken from Mount Pierce looking at Mount Eisenhower and Mount Washington in the way back. Photo taken by hiker Matt Thompson. Photo taken June 19, 2014. 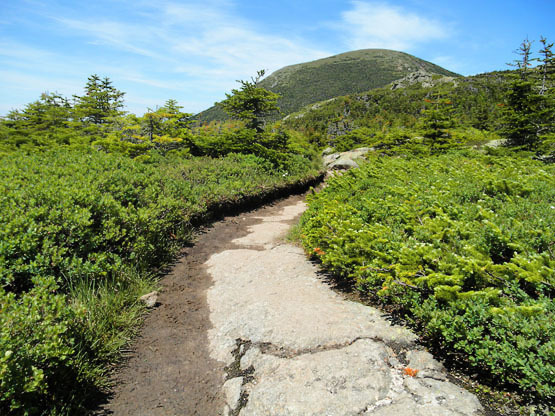 Both parking lots for this hike are located on Mount Clinton Road off Route 302 in Carroll, New Hampshire. From the junction of Route 3 and Route 302 in Twin Mountain, New Hampshire, follow Route 302 East bound for 8.0 miles. Turn left onto Mount Clinton Road. If you are traveling from the East, Mount Clinton Road will be on the right hand side of the road .20 miles past the AMC Highland Center (or roughly 3.0 miles West of the Willey House Historical Site.) Take your first left on Mount Clinton Road into a parking lot. The Crawford Connector Trail begins at the far end of the parking lot (to the right of the toilets). From the Crawford Connector parking lot (directions above) continue down Mount Clinton Road for 2.3 miles until you reach a parking lot on the right.